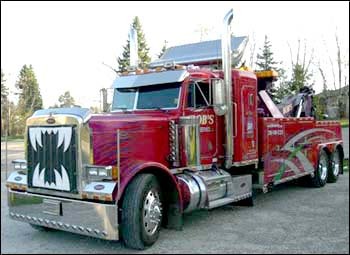 New at Bob’s Towing is the fact that we have expanded our towing division. We have accomplished this by purchasing a medium wrecker, 2 heavy duty wreckers and by joining forces with are now sister company B & D towing in North Royalton, Ohio. Our ever growing fleet 10 trucks can handle anything from a compact car to a fully loaded semi truck and trailer 24/7. One wrecker is a true American icon for sure. It possibly could be the only one of it’s kind still left in America . 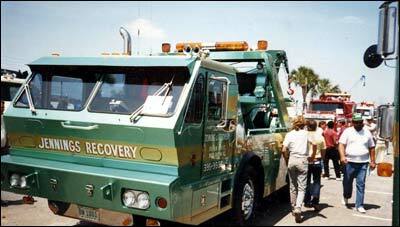 It is a great work horse and awesome recovery wrecker and will not mistake it when you see it on the road. Here is a picture of it back in the Florida towing show when it was new. The next, is an awesome Peterbilt 35 Ton Wrecker. This award winning show truck is able to perform anything from a simple tractor swap out to a total off the roadway roll-over with ease. It is fully equipped with everything from roadside safety equipment to generator and emergency lighting system. All to perform any job safely and professionally.